Django Unchained is a love-it-or-hate-it movie-going experience. Tarantino’s decision to make a spaghetti western/slave revenge fantasy seemed like a cynical move to generate controversy from the get-go. Now it’s in theaters everyone has an opinion, especially when it comes to the provocative depictions of race. There are those who celebrate the bold representation of Django, the freed slave who fights back against a particularly sadistic slaveowner, claiming what is rightfully his (Hildy, his wife), burning the pristine white columns of the mansion to the ground in the process, and riding off into the middle distance. There are others, notably Spike Lee, who have questioned the oversimplification of these images and the apparent trivialization of genocide. American Slavery Was Not A Sergio Leone Spaghetti Western.It Was A Holocaust.My Ancestors Are Slaves.Stolen From Africa.I Will Honor Them. The movie has also been criticized for its objectification of women, the cartoonish (and anachronistic) representation of the Ku Klux Klan as buffoons suffering a wardrobe malfunction, and Tarantino’s Australian accent. Some critics couldn’t stomach the blood spatter of the gunfights. Others thought Tarantino’s trademark violence, once so exciting, has become so normalized it seems tired. It’s a problematic film on many levels. However, Tarantino has to be commended for opening up discourse — and, potentially, opportunities for other filmmakers — about the slave era, two hundred years of history that American mainstream pop culture likes to pretend never happened. Other than grisly blaxploitation like Mandingo, or historical lamentation like Roots, slavery has been off-limits as context for a period drama. Until now. Like it or not – and as Lincoln demonstrates – America’s modern political and social identity is shaped by its slave-owning origins. While Django Unchained might be disrespectful to the memory of those who lived and died as slaves, it’s also disrespectful to ignore their contribution to history. If, as in Spike Lee’s comparison, slavery was a Holocaust, where are the movies examining and reconstructing the terrible experiences of the victims? Hollywood has churned out countless tales of suffering, nobility, cruelty and the triumph of the human spirit set in the Jewish ghettos and concentration camps of Western Europe in the 1930s and 1940s. Why not examine the systematic persecution of one race by another that occurred much closer to home, and spanned centuries rather than a couple of decades? It’s heartening that two of the most influential directors in Hollywood, Spielberg and Tarantino, have grasped the nettle with their films this year, perhaps opening the door to more stories of the era being greenlit? Django Unchained brings the era to life. Kudos to the production designers – it’s a masterpiece of mise-en-scène, with the beloved tropes of the Old West (big sky, dusty trails, a gunfight on Main St., an anti-hero in a black hat) blended with the bucolic antebellum South (Spanish moss-draped trees, immaculate white plantation mansions, ornamental enslaved women). We’re used to compartmentalizing our cinematic depictions of America in the mid-nineteenth century, the arid landscapes of gold prospectors, pioneers and marauding Native Americans in one box and the rich cotton fields, tree-lined drives and ballrooms of the elegant South in another. It’s difficult to reconcile Paint Your Wagon, Seven Brides for Seven Brothers, How The West Was Won, The First Great Train Robbery and The Frisco Kid as contemporary stories to Gone With The Wind and Jezebel but they’re all set in the same decade in the same nation. Django Unchained blends the Wild West with the Mannered South and presents the result as a single, continuous, all-American experience. This is a potentially fascinating diegetic world, full of ideological and territorial conflict, but Tarantino is content with plowing the easiest available narrative furrow. Superficially, it’s as though he’s afraid to challenge his audience with anything other than the simple, binary tale of a righteous black man versus a lot of ignorant, cruel white men. Woo! Yeah! Watch Django shoot those fat racists in the head! Cue stereotypes, and oppression, tyranny and persecution played for laughs. Tarantino sidesteps many of the racial issues by positioning his (mainstream, white) audience as enlightened post-colonials who, free of personal racism or slave-owning guilt, can view the horrors of the era as lurid entertainment, historical curiosities, nothing more. In an interview with the Guardian, he described slavery as “absurd and bizarre”, and his vision of the times offers up a straightforward solution: retaliatory violence. Django rises up against his oppressors and gets his Happily Ever After. All very neat and uncomplicated. It’s just a dumb movie, right? Yet Tarantino is smarter than that. Although skin color is the obvious flashpoint on screen – and the issue most likely to attract critical ire – Django Unchained buries an intriguing and potentially subversive commentary about class deep in a subplot. Slavery in the antebellum South didn’t just divide society along color lines. It shored up the gap between the haves and have-nots and made social mobility almost impossible, whatever your race. Nonetheless, there were underdogs who figured out how to live high off the hog. Tarantino gives us one of these in Stephen, a house slave so servile and obsequious he’s a clown. Samuel L. Jackson mines the “Massuh! Massuh!” eye-rolling stereotype with verve, inhabiting a character so cringeworthy Stepin Fetchit might have balked at playing him. Our first encounter with Stephen presents him as a victim of slavery, an old man made near-imbecilic by 76 years of plantation oppression. His antics are difficult to watch, a chilling example of the effects of lifelong humiliation and servitude. He draws our modern liberal pity even more so than the slave ripped to pieces by dogs in the previous scene. He represents the point at which the white audience stops laughing. Stephen is outraged by the sight of Django astride a horse. He shrieks and cowers, jabbing his fingers at the uppity black man like he was the Devil incarnate. The bystanders (and the audience) see this as part of the general comic entertainment Stephen provides, another example of how stupid he is to be so defensive of the system that has oppressed him. Yet, as it turns out, Stephen is only feigning servility. He’s been working the system from within for a lifetime and he’s the puppeteer, not the gibbering, jazz-handed puppet he pretends to be. If he wants to sip fine brandy from exquisite crystal in the library while he ponders his next move, no one’s going to tell him no. When he tells Calvin Candie to jump, the young white man jumps. Slavery has been good to Stephen, but his fancy clothes, full belly and taste in fine wines have come at a price. Like Django, Stephen has prioritized his individual needs. Unlike Django, this has meant aligning himself with the slaveowners and lording it over other slaves. Success involves betraying his color and class. At some point, deep in the past, Stephen figured out this was the only way to thrive. Then, in rides Django to prove him wrong. Like Stephen, Django’s loyalties don’t run along color lines. He partners with Dr. Schultz when the white guy offers him clothes, a horse, and a share in the profits from bounty hunting. His goal is to rescue Hildy – even though no one ever asks Hildy if that’s what she wants – in order to meet his needs as an individual. He doesn’t particularly care about freeing other slaves, although he tries not to shoot them if he can help it. He hasn’t compromised, or sold his integrity down the river. Sitting high in his elegantly tooled saddle, he’s a slap in the face for Stephen, a sign that the house slave got it wrong all along, that he didn’t need to abase himself to get where Django’s at. That’s when Stephen decides to slap the interloper down. He can’t live with himself and all he’s done if Django (and his individual, independent belief system) survives and thrives. 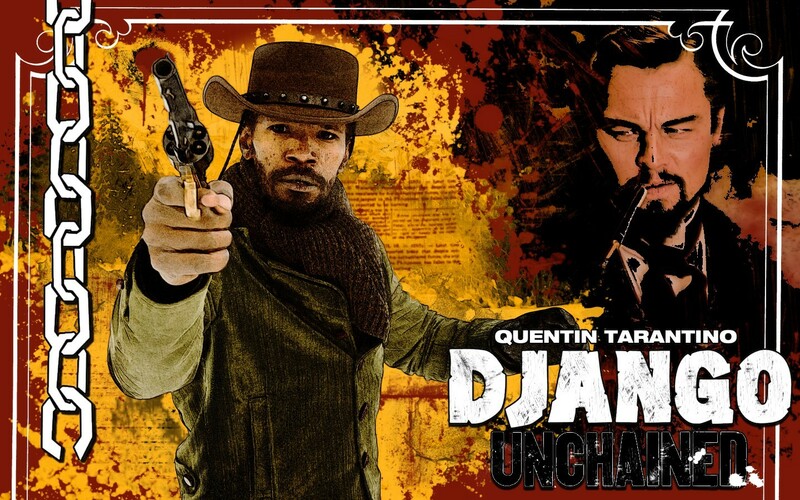 And so it becomes apparent, this late in the movie, that the core conflict isn’t black vs. white – that’s just window dressing, easy target practice for Django on his hero’s journey towards his true antagonist. That journey won’t be done until he’s gone mano a mano with Stephen, the freeman who’s risen in defiance of the system versus the slave who’s sold his soul for perks. Django Unchained isn’t necessarily about racism. It’s about those who’ve figured out a way to rise outside the system challenging those who feel they need to bow down and play by the rules. And we can all relate to that. It’s a shame that Tarantino doesn’t address this essential (and timely) conflict until the third act, and that he feels the need for both Django and Stephen to have white stalking horses (Schultz and Candie) to distract the audience from the true protagonist/antagonist polarity. Back in the (Reservoir Dogs) day, he might have made a muscular 90-minute low budget masterpiece focusing on the rivalry between Django and Stephen and their bloody battle for the moral high ground. That would have been utterly compelling. Instead, he delivered a rambling 165-minute homage to Westerns, with revenge added for extra spice, but ultimately lacking the courage of its original convictions. This entry was posted on Thursday, January 3rd, 2013 at 1:02 pm	and is filed under Movies, race. You can follow any responses to this entry through the RSS 2.0 feed. Both comments and pings are currently closed.